At least 257 people, including 26 Polisario members, were killed, in the Wednesday morning crash of an Algerian military plane, shortly after it took off from Boufarik airbase (Blida), around 25 km southwest of Algiers, reports the Algerian daily “Ennahar” citing security sources. 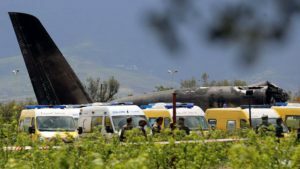 According to a statement from the Algerian Ministry of Defense, ten crew members and 247 passengers, “mostly personnel of the National People’s Army and members of their families”, were killed in the crash. According to Algerian media, 26 members of the Polisario were on board this Russian-made “Iliouchine Il-76” aircraft, which was flying to the military airport of Tindouf in southwestern Algeria. An investigation was ordered to elucidate the exact causes of the crash. According to the technical data sheet of the Russian manufacturer, the aircraft can transport between 126 and 225 passengers. Various media outlets report that the plane may have been overloaded. Footage broadcast on Wednesday by Algerian TV channels shows a huge plume of black smoke billowing from an area near the runway. Dozens of fire trucks and ambulances were seen on the scene of the accident. The Algerian media noted the presence at the scene of the Deputy Minister of Defense and Chief of Staff of the National People’s Army (ANP), General Ahmed Gaïd Salah, who, they said, ordered the “immediate establishment of a commission of inquiry to determine the circumstances of the accident”.